Historically, Irish cuisine doesn’t get much respect in the culinary world; traditional Irish dishes can be simple and even unsophisticated – I say so lovingly :) . But there are a few exceptions to this rule, and homemade brown bread is one of them. 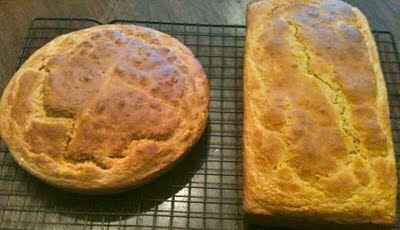 This recipe comes from lifelong brown bread baker Auntie Mary, aunt and neighbor to our family in Dublin. I’ve adapted the recipe from metric to standard, but other than that, it’s the same easy recipe Auntie Mary has been using forever–a real taste of the best of the emerald isle! Combine dry ingredients. In a separate bowl, combine wet ingredients. Using a fork, stir dry ingredients into wet ingredients. Pour the batter into a greased circular cake pan or deep rectangular bread pan. Make an X across the top of the batter and sprinkle with the remaining palmful of sesame seeds. Bake about 50 minutes, until toothpick inserted into the middle of the bread comes out clean. Enjoy with ham and cheese, with soup, or buttered with tea. Previous Braised Cabbage with Pork. Next Buffalo Chicken Grilled Cheese.